Newage Testing Instruments microhardness testers, such as the HMV-2 Series, MT90 Series or a C.A.M.S. system, can be supplied with an X-Y stage for automated traversing applications. 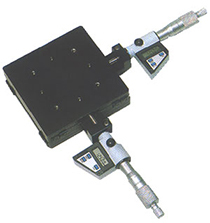 We offer manually controlled X-Y stages with and without micrometers, and motorized X-Y stages such as the MS-251. We suggest you contact us when considering an X-Y stage for your hardness testing application. Click on the menu below to see some of the X-Y stages offered by Newage Testing Instruments. X-Y Stage, manual, without micrometer. X-Y Stage, manual, with micrometer.